The Model 3 is the linchpin in Musk's plan to bring electric cars to the mainstream. SAN FRANCISCO -- An unlikely naysayer has emerged as Tesla prepares to market the all-important Model 3 sedan to consumers: Elon Musk himself. Two months before the electric-car maker plans to begin production of its first vehicle to sell for near mass-market prices, the CEO told investors he's concerned expectations are too high. Tesla will be "anti-selling" the Model 3, offering no test drives or advertising for six to nine months, he said after reporting a first-quarter loss. "We're doing our best to clear up that confusion so people do not think that Model 3 is somehow superior to Model S," Musk, 45, said on a conference call Wednesday. "Model S will be better than Model 3, as it should be because it's a more expensive car." The Model 3 is the linchpin in Musk's plan to bring electric cars to the mainstream. Tesla is targeting output of a million cars per year by 2020, a sharp rise from the roughly 84,000 the company produced in 2016. Reaching that ambitious goal will require ample sales of lower-priced vehicles like the Model 3 rather than the pricey luxury autos it's offered so far. Slated to start at about $35,000 before options or incentives, the Model 3 will be capable of driving roughly 346 km (215 miles) between charges. The cheapest version of the Model S starts at around $70,000. Model 3 will have less range, acceleration, power and room than the Model S. But because the "3" moniker conjures the impression of a next generation to buyers used to upgrades -- think Apple Inc.'s iPhones -- some existing customers erroneously think the Model 3 will be a step up. Tesla has seen some impact on Model S orders as a result of the misunderstanding, according to Musk. While the company began to take action to correct this about a month ago, "that message has not filtered down to all of our customers." 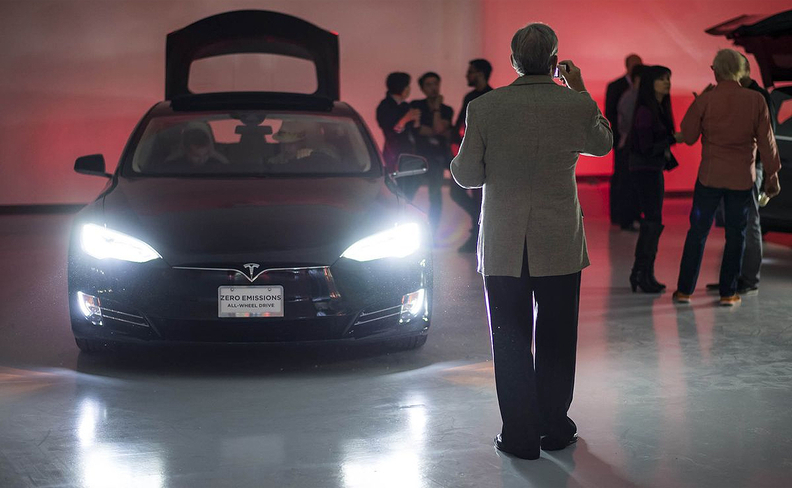 Tesla first unveiled the Model 3 in March 2016 during a late-night party at the company's design studio near Los Angeles. Thousands of fans stood in lengthy lines at Tesla stores to place $1,000 deposits for the vehicle. Musk hasn't given an updated reservation count since the carmaker said it had taken about 373,000 as of May 2016. The "anti-sell" strategy hasn't had an effect on that number, according to the CEO. "Our net reservations continues to climb week after week," he said. "No advertising. Anti-selling. Nothing to test drive. Still grows every week."